Help the UMHS Survival Flight team beat Ohio State University’s MedFlight! 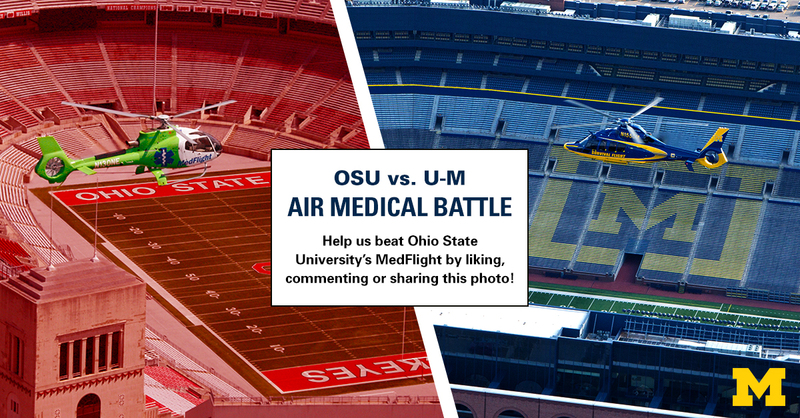 Through kickoff of the Big Game between U-M and OSU on Saturday in Columbus, the two air medical teams are competing to see who can get the most likes, comments and shares on the top post on their Facebook page. The post will look exactly like the image shown in this article. The team with fewer likes, comment and shares will pose in front of their helicopter wearing the winning team’s colors. Don’t make your UMHS colleagues wear the scarlet and gray! Please visit Survival Flight on Facebook and like, comment and share the top post. Go Blue!